The following surnames have genealogy eBooks on this page: Ames, Bolles, Chapin, Deserted Village, Dubrish, Eby, Fiechter, Greuber, Huntting, O'Conner, Santee, Tenny, Todd, Wheat, Wolcott, and Woodworth. Blue indicates softcover editions may be available. Welcome to Bookshelf 3 at Hawkeyes Trading Post! Ames Family History and Genealogy. PDF eBook English 4.24 MB. 2009. The Ames family history begins with John Ames born in 1540 at Bruton, Somersetshire, England. Over 400 years ago! An adventurer, his grandson William Ames (1605-1654) crossed the Atlantic aboard the wooden ship and settled in Norfolk, Massachusetts. Then pioneer Barzilla Ames (1765-1849), Williams 3rd great-grandson, entered the Northwest Territories and settled in Greenfield, Michigan. This publication lists 12 generations of Ames family descendants! 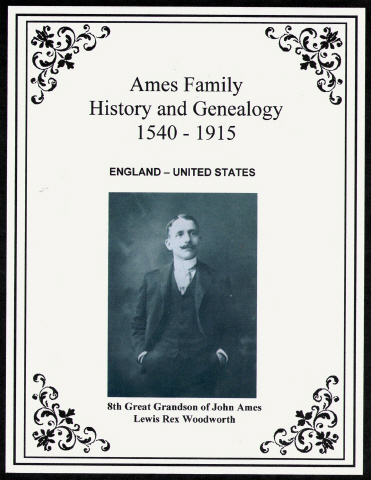 A great resource for Ames family genealogy! Price $9.95 USD. 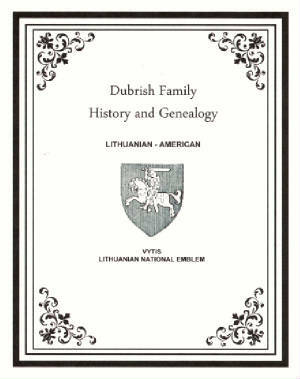 Dubrish Family History and Genealogy. PDF eBook English 4.82 MB. 1984. Joachim and Pauline Dubrish had a farm just outside of the capital city of Vilnus, Lithuania, in the late 1800’s. Their son Martin immigrated to American in 1905, and he was followed shortly by his brother Theodore. From Ellis Island they traveled to Chicago, then on to Detroit, Michigan. The Dubrish-Holmes-Woodworth connection has descendants that link back to the Mayflower Compact! A great family of pioneers and patriots right up to the present day! 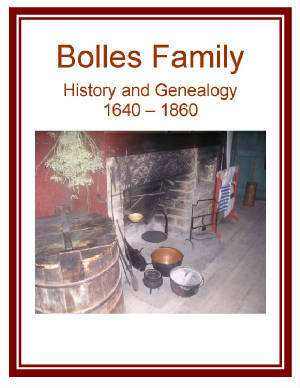 The book offers many unique family photographs, historical family documents, genealogy, and family legends. Price $9.95 USD. 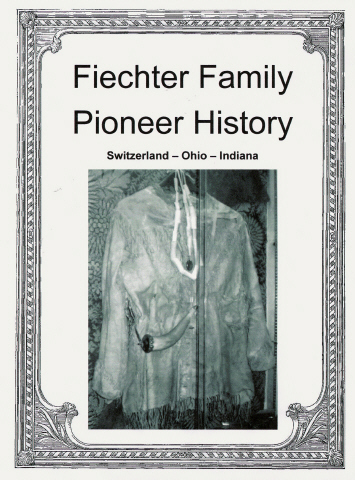 Fiechter Family Pioneer History - PDF eBook - English 19.7 MB. 2009. Andrew Fiechter (B. Abt 1838 – D. 11 Aug 1863) was a Swiss immigrant who came to the United States in 1858. With his wife Maria (B. abt 1842 – D. Unk) they settled in Wayne County, Ohio. After Andrew’s death in the American Civil War the family moved to Indiana about 1872. Son Jonathan Fiechter married Catherine Reinhard, and they had at least 7 children. The book portrays early pioneer life of the Fiechter Family on the rich black soil in Northeastern Wells County, Indiana. It may also provide excellent starting points to begin further research into Fiechter family genealogy! Price $6.95 USD. Hunting Family History and Genealogy or The Hunting (Huntting) Family in America. PDF eBook English 4.38 MB. 1888. 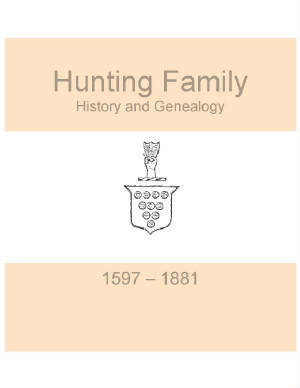 The legend of the Hunting family name is established from the year 1550 in this well written eBook. The family history is documented from the year 1597 to 1881 with over 600 names alphabetized and indexed for easy reference! A fascinating account of the Hunting (Huntting) ancestral life beginning over 400 years ago! Price $6.95 USD. 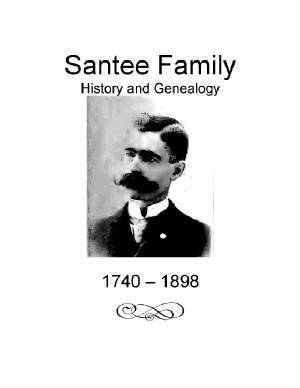 Santee Family History and Genealogy or The Genealogy of the Santee Family in America. PDF eBook English 3.33 MB. 1899. The 1690 legend of the family name is presented in this amazing well compiled book, along with numerous rare ancestral photographs! A “tabulated history” with Santee descendants from the year 1740 to 1898 is presented including an alphabetical listing! A real treasure for any genealogist in the Santee family! Price $6.95 USD. Todd Family History and Genealogy or The Todd’s of the Eastern Shore, Maryland. PDF eBook English 4.23 MB. 1912. 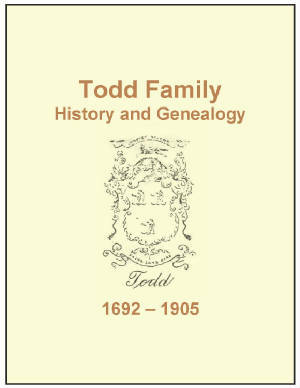 The early legend of the Todd family name is presented with excellent genealogy records compiled from the year 1692 up until 1905. Extracts from land records are included, which provide outstanding evidence for validating descendants of over 200 years ago! This is a treasure of information! Price $6.95 USD. 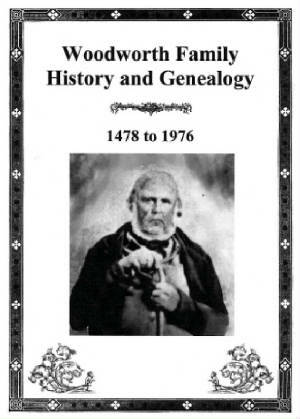 Woodworth Family History and Genealogy. PDF eBook English 11.6 MB. 2009. This eBook documents the Woodworth Family from the year 1478! It provides the astonishing connection to Thomas Rogers, who was one of the forty-one signatories of the Mayflower Compact! The book includes Revolutionary War Veteran Josiah Woodworth with photograph, and genealogy to Florence Woodworth (1891-1976). 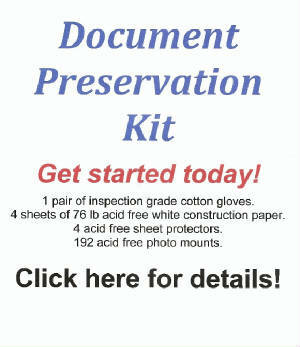 Many unique ancestral photographs, family documents, and is well referenced. A great resource of history for one of America’s long standing colonial families! Price $9.95 USD. 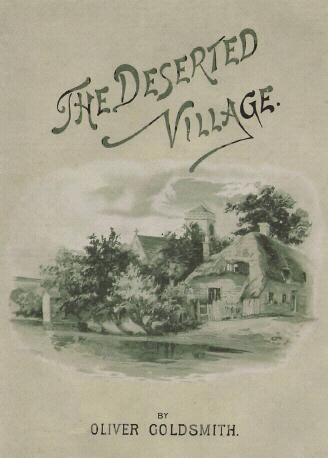 The Deserted Village. PDF eBook English 8.71 MB. 1892. Originally published: Philadelphia, J.B. Lippincott Company, 1892. Childhood memories are recounted of cheerful Springs and Summers, and the games played over manicured lawns of Auburn Village. These great childhood memories give way as the country people move to the city for the easy jobs. This eventually depletes the village to desertion. To relive his fond childhood memories the poet had returned to his memorable village where he writes about the good life in youth, and how the village had slowly declined. The story is very similar in nature to present day realities where only 2 generations ago people moved from the agricultural based farms to city offices. Easy reading poetry with excellent flowing rhyme from the year 1892. This book is now available for anyone wishing to see how history has repeated itself. Price $4.95 USD. 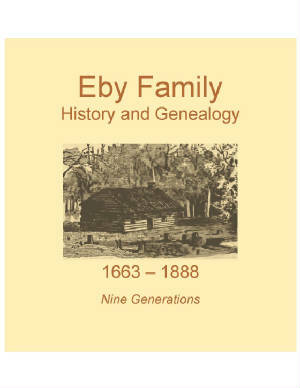 Eby Family History and Genealogy or A Biographical History of the Eby Family. PDF eBook English 4.07 MB. 1889. Here is the story of the Eby family who emigrated from Italy to Switzerland, from Switzerland to Germany, then from Germany to America before making their home in Pennsylvania. Theodorus Eby arrived in America in the spring of 1715. This detailed history covers 9 Eby generations from the year 1663 to 1888 with very interesting short biographies on family members! There are several rare etchings of early Eby ancestors. A great reference for the Eby family genealogist! Price $6.95 USD. Greuber Family History and Genealogy. PDF eBook English 1.86 MB. 2009. William T. Greuber was born in the Ohio territory during the year 1825. He married Mary McClintock about 1854, then joined the Union Army during the War Between the States. They had 8 children. This publication contains 5 generations from 1825, numerous rare ancestral photographs, maps, and many documents. 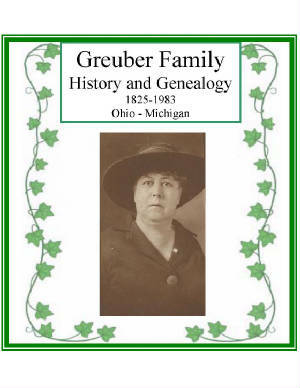 Filled with essential information for the Greuber family genealogist! Price $9.95 USD. 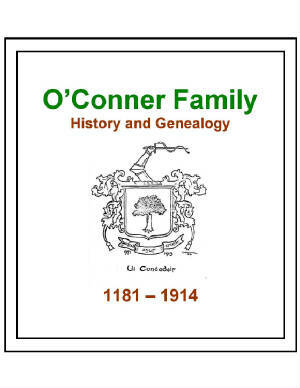 O’Conner Family History and Genealogy or the O’Conner Family. PDF eBook English 1.65 MB. 1914. A fascinating oral tradition regarding the roots of the O’Conner Clan in Ireland is now documented in this eBook, which covers the years from 1181 to 1641. Being born in Ireland, about the year 1756, it is Mathias O’Conner who is the first adventurer who crosses the Atlantic to the American Colonies. Aye, then the genealogy of 5 additional generations are referenced that extend from 1756 to 1914 of O’Conner descendants! A keen resource for the family genealogist! Price $6.95 USD. 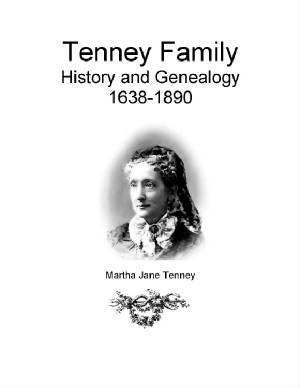 Tenney Family History and Genealogy or The Descendants of Thomas Tenney. PDF eBook English 18.1 MB. 1894. A fascinating account of the Tenney Family in early American life with genealogy from the year 1638 to 1890. Numerous very rare ancestral photographs are embedded throughout the writing, with short biographies of family members! There are hundreds of family members alphabetically listed on 42 pages of indexed family names! Over 400 pages of noteworthy information! A must for any Tenny family genealogist! Price $6.95 USD. 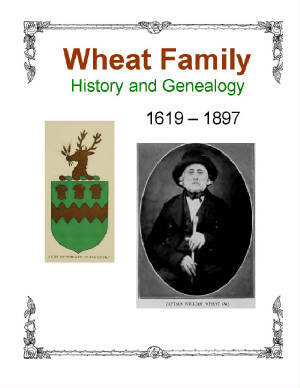 Wheat Family History and Genealogy or A History of the Wheat Family in America. PDF eBook English 8.58 MB. 1903. This book is filled with fascinating information of historical value for any member of the Wheat family, or anyone with a variation of the spelling of the Wheat surname. 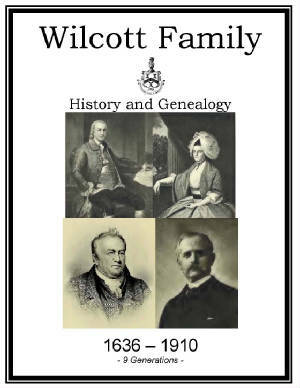 A very well written account of the Wheat Family in America, with details of the earliest immigrants who resided in Concord, Watertown, Westford, and Franklin. Also, included are English Parish Registers, Probate Records, Herald’s College Rolls, and the ancestors who lived in Glympton, Retford, and East Markham, England. The history documents the years from 1619 to 1897 with legends prior to 1600. A remarkable work now available for any family member! Price $6.95 USD. Wilcott Family History and Genealogy. PDF eBook English 19.6 MB 1912. An extraordinary history of the Wilcott family from the year 1636 to 1910, with the Family Coat of Arms, handwritten letters from centuries ago, tombstone etchings, and many rare family photographs and fine pencil drawings. There are 9 generations with an appendix that lists the family tree into family groups with vital dates. An index of nearly 20 pages provides over 1,400 names which are listed in this eBook. 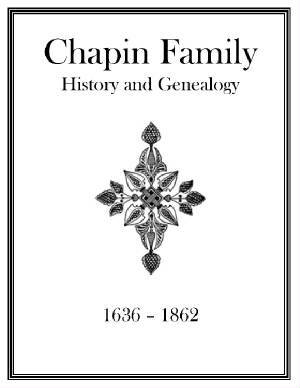 A treasure of information for any Wilcott family member interested in family genealogy! Price $6.95 USD.